And add a tooltip explaining this 1Kb transaction size. Agree on hiding all the extra sliders and text by default if the recommended fee for a fast transaction confirmation is the same as the Required Fee. Thanks for your feedback, we will see if others comment on this before making further changes. Slow means paint the front of your house slow, not the whole house! Mining is much faster with other software, but is more complicated to set up. This error means that the client may have been shut down, while the miner was trying to mine. Given how the 51% defense works, this mining program probably will be very ineffective. Definitely still relevant. Eliminating ambiguity with every 'end user' is the goal but ultimately sacrifices usability to some degree. I believe the following configuration eliminates all ambiguity while fully preserving usability. The ambiguity arises when we add the second checkbox. Another option would be to remove the "Send as zero-fee transaction" checkbox altogether and leave the "Pay only the required fee" option. Then we would allow the counter to be rolled back to zero preserving the zero fee functionality just making it less obvious. One thing's for sure, we don't want any zero fee option available to the user unless they enter the custom settings. Most users should use the client's default fee settings. The custom settings should be used by advanced users only. We'll probably want to make a decision on this sometime this week unless we want to delay the new client further. After looking at the code, I think there is a way to the second option, which the user enters 0.00000000 for the fee. Currently, that will still result in the minimum fee being paid. In that case, I'm fine with the second option of removing the "Send as zero fee" checkbox. We can always add it back later in future updates. This will also give users a more consistent experience across apps, since all other apps charge a transaction fee by default. At the same time, advanced users will still have access to sending zero-fee transactions by entering the custom settings and rolling the counter back to zero. Note: Since the Goldcoin network does not have a required fee we might consider renaming the checkbox. This will also make the language of the tooltip consistent with the wording of the checkbox. 1. Send as zero-fee transaction is hidden. The code is still in the app with all the translations that we have in case we want to use it later. 2. The edit field for the fee can be lowered to 0.00000000 and the transaction is sent as zero fee. 3. The "total at least" radio button was not removed. This is only activated if Coin Control is used. Not sure why. This sets a minimum fee that will be paid in the transaction. For example. you set it to 0.001, so your transaction will have a fee of at least 0.001. If the "per kilobyte" is set, then the fee could be lower than 0.001 depending on the transaction size. another example. 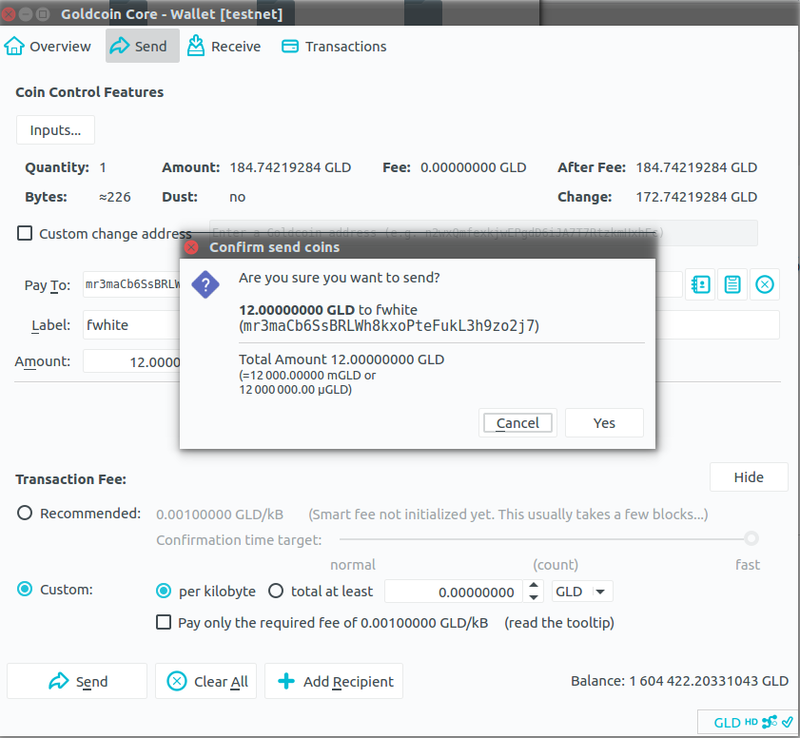 We are sending 10 GLD and the transaction size is 0.5 kB. For transactions greater than 1kB, this "total at least" option is no different than the per kilobyte version in how fees are calculated. Perhaps we don't really need this option after all.